Tue, 8 May 2018 14:14 . Hits: 120x. UNUJA AC.ID - Taiwan. Rector of University of Nurul Jadid (UNUJA), KH. Abdul Hamid Wahid, M.Ag., signed a Memorandum of Understanding (MoU) with Taiwan's 45 Universities on Sunday, April 15, 2018. The signing held at Asia University Taichung, Taiwan, was one of an activity series organised by Taiwan Ministry of Education, the General Committee of Nahdlatul Ulama (PBNU) and Taiwan Education Centre. "This is a collaborative activity between the Ministry of Education of Taiwan and PBNU arranged by Taiwan Education Centre based in Indonesia", said Rector of UNUJA. 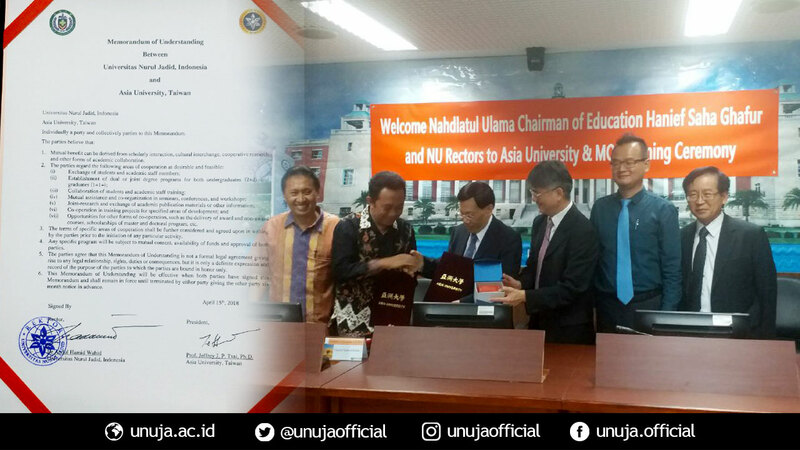 University of Nurul Jadid collaborates with 45 universities in Taiwan to support each other in various forms of cooperation, including provision of scholarships, student exchange, guest lecturers and many others. Sat, 19 May 2018 10:58 . Tue, 8 May 2018 14:46 . Tue, 8 May 2018 13:47 .